Please read the general education and the experiential sections of the catalog carefully. Students are encouraged to meet with an academic advisor (435) 586-5420 for assistance in academic planning. The mission of general education at Southern Utah University is to foster in students the intellectual and practical skills necessary as a foundation for successful life-long learning. The General Education (GE) program at SUU is central to its liberal arts and sciences mission. Course work is offered in core competency areas (English, Math, etc.) and across multiple disciplines to help broaden a student’s knowledge and understanding of the arts, humanities and the sciences. The GE core encompasses 16 to 17 credits of course work consisting of introductory classes in English, Math, Information and Computer Literacy, and American Institutions. An additional 16 to 18 credits of introductory course work is required across five broad Knowledge Areas: Fine Arts, Humanities, Social and Behavioral Sciences, Life Science, and Physical Science. The learning outcomes of courses in GE are designed to help students acquire skills and knowledge that continue to enhance during their studies at SUU. For a general associates or bachelor’s degree, the General Education (GE) program requires 32-35 credit hours of course work. A minimum of 3 to 4 credit hours in each of the five knowledge areas. The University provides alternate means of satisfying requirements in the general education program. Students may complete general education requirements through Advanced Placement (AP) courses in high school or by taking a series of tests under the College Level Examination Program (CLEP). Students interested in alternate means of satisfying general education requirements should refer to the “Credit by Examination and Individual Study” section of this catalog or contact the Testing Center at (435) 865-8071 or their college advisor. An Associate of Arts or an Associate of Science degree earned at any institution within the Utah System of Higher Education, or at other non-Utah institutions with articulation agreements, will be considered as meeting the General Education requirement of any institution in the system. When the General Education requirements of an institution not offering the Associate of Arts or Associate of Science degree have been met in earning a 60 to 63 credit hour diploma, a Registrar’s certification that the transferring student has completed baccalaureate-level General Education requirements at the sending institution will be accepted by SUU in lieu of the AA/AS degree. In the latter case, the Registrar at the sending institution will forward to SUU an up-to-date description of the General Education requirements. Students transferring to SUU from another institution are required to forward an official transcript for each college or university attended. Credits earned in general education from a campus in the Utah System of Higher Education are transferable to SUU. Credits earned at a community college or at a university outside of the state of Utah will be evaluated before acceptance for transfer to SUU by the Registrar’s Office. The core requirements for General Education encompass 16 to 17 credit hours of course work in English, Quantitative Literacy, Information Literacy, Computer Literacy, and American Institutions. These courses are intended to give students knowledge and skills necessary to effectively communicate, be able to demonstrate basic mathematical competency, perform information research and searches, effectively use integrated software tools, and have an understanding of history of the United States and its economic and political systems. 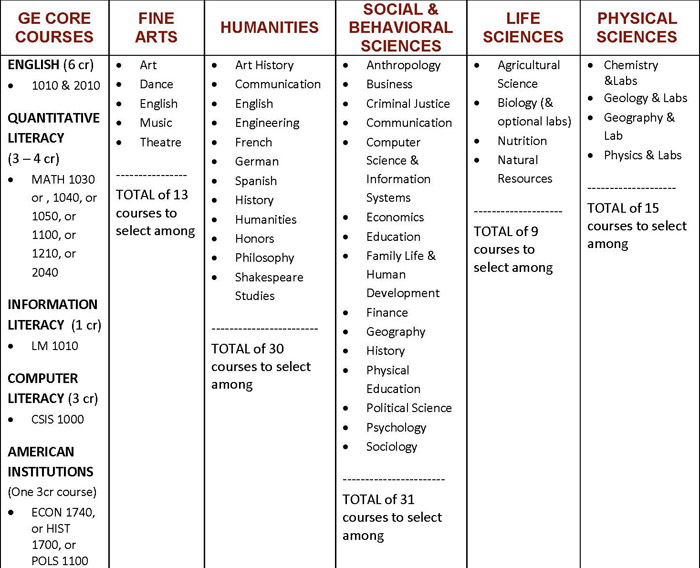 *Core course requirements as of 2013-14: Students must complete the English, Quantitative Literacy, Information Literacy, and Computer Literacy course work before they have earned 60 credit hours at SUU. While not required, students are urged to also complete the American Institution requirement within their first 60 credits. Goal: To develop students’ understanding of the scope and variety of works in the fine arts (i.e., art, music, theatre, and dance); to deepen their understanding of the aesthetic standards used to make critical judgments in various artistic fields, and how that imaginative process is informed and limited by social, and historical contexts. Goal: To develop students’ understanding of human thought through works of literature, theology and philosophy; to deepen their understanding of how human processes are informed and limited by social, cultural, linguistic and historical circumstances; and to appreciate the ideas of others and in cultures and countries not their own. Goal: To develop students’ understanding of themselves and the world through the study of methods and theories used by historians, social and behavioral scientists. Courses in this knowledge area seek to, describe, explain, and analyze individual and collective human behavior and relationships. These courses prepare students to grasp the diversities and complexities of human life, past and present, and come to an informed sense of self and others. Goal: To develop students’ understanding of the principles and procedures of science and to cultivate their abilities to apply the empirical methods of scientific inquiry. Students should understand how scientific discovery changes theoretical views of the world, informs our imaginations, and shapes human history. Students should also understand that science is shaped by historical and social contexts. ENGL 1010 may be waived for students with ACT English subscores of 29 or above. Students with an ACT English sub-score below 17 must take ENGL 0990 as a co-requisite to ENGL 1010 . Complete 16 to 18 credit hours with a minimum of 3 credit hours in each knowledge area. (4 in Physical Science). Courses with the same academic prefix cannot be counted in more than one knowledge area. ** Students may take either FLHD 1500 or PSY 1110 , not both. *** Labs in some Life Science courses are required to be taken concurrently with the lecture. Consult an advisor for more information. Student pursuing a major in a science related field are strongly encouraged to take a lab with their life science courses. **** Labs in all Physical Science courses are required to be taken concurrently with the lecture. Consult an advisor for more information. SUU’s Experiential Education requirement is based on established experiential education pedagogy and best practices. The requirement is completed via the EDGE Program. The design and execution of the program affords students hands-on opportunities to gain practical experience while achieving a deep and rich understanding of the process of researching, planning, proposing, completing, and reflecting on a rigorous academic experience. These are skills transferable to any professional life. There should be culminating documentation and celebration of the learning to help provide closure and sustainability to the experience. All students must complete the Experiential Education requirements to graduate with a bachelors degree. An accelerated version of the program is possible for transfer students. Transferring of credits from other schools to fulfill EE requirements must be approved by the Dean of University College. SUU’s academic mission is to provide students with a unique experiential learning opportunity designed to broaden social and cultural perspectives through civic, creative, global, leadership, and outdoor engagement opportunities. Students may utilize learning methods and programs such as undergraduate research, service learning, internships, honors, or other individualized learning processes. Students have many options in choosing at least one program and one engagement center to complete their “Experiential Education Requirement” (EER). The Community Engagement Center promotes learning through meaningful service and active engagement with local, regional, national, and global communities. It upholds the University’s core values of academic excellence, social responsibility, involvement, and personal growth. If helping people and making a difference is a student’s passion, they will fit right in at the Community Engagement Center. The Creativity & Innovation Engagement Center promotes the idea that creativity is a crucial feature of any education that promises to prepare students for a future that defies prediction. The Center exists to support students in developing their aptitude for creativity and divergent thinking. It promotes the idea that creative thinking is critical in the lives of educated people and welcomes students who want to learn creativity and enrich their lives and the lives of others through innovative thinking. The Global Engagement Center fosters cultural understanding and personal enrichment for students to pursue intellectually stimulating programs in a variety of locations worldwide. The Center helps students gain practical and informed awareness of their global citizenship. Students interested in global engagement can study abroad with year-long, semester-long, or short and intensive programs. The Leadership Engagement Center helps foster leadership behaviors that enable students to learn and practice critical thinking, clear communication, empathy for others, and personal integrity. It helps students become conscientious and accountable leaders within their chosen organization or community. It encourages leaders who act for the well-being of others and welcomes students interested in any type of leadership experience. The Outdoor Engagement Center helps students appreciate the uniqueness of studying at a University within a half-day’s drive of 11 national parks, national monuments, and recreational areas. It not only promotes engaging with the natural splendor of the outdoors, but also learning about and connecting with the environment and environmental issues that impact everyone. Outdoor work and study are inherently experiential in nature, and students working with the Center can pursue a vast array of opportunities regionally and beyond. The Center works closely with multiple park, recreation, tourism, and wilderness organizations to facilitate rich opportunities for SUU students. EDGE Projects contribute to a high-caliber education by allowing students a formal opportunity to create their own learning experience and to participate in learning through experiencing. Phase 2 - Students explore and expand ideas for their project. No universal course. Students move to Phase 3 after deciding on an EDGE Project. This can be completed any time after UNIV 1010 but before students earn 75 credits. Phase 4 - Formal Engagement - Credit or non-credit bearing depending on proposal. No universal course. The experiential education EDGE Program (Education Designed to Give Experience) is a student-centered process that is relevant, authentic, and potentially transformative. Experiential learning enhances personal, academic, and professional growth by promoting opportunities for engaged and active learning.